Love true events and stories? Mission Breakout have two different escape rooms one based on war called The Codebreakers and another on paranormal activity called The Lost Passenger. This explosive escape rooms in London will get any ones heart racing. This is a real-life room escape game located in the borough of Camden in Central London underground in a old disused underground station (South Kentish Town) that closed 1924 that was also used as a World War II shelter. You will be locked up inside a room in the historic disuse underground, your team will have 60 minutes to escape from the abandoned place using your mind, good sense and teamwork to find clues and solve many puzzles mainly code based. Strong and effective communication, time management and group determination are the keys to bring your team to escape ! Teams can consist from 3 to 6 players. Fun for all the family, friends or colleagues. Based on a true story back in 1924 a passenger went missing in this South Kentish Town tube station. It was said that a man absentmindedly alighted. The train departed and passenger Mr. Brackett disappeared in the darkness with no one ever knowing if he escaped. To book any of these games click here. Thanks to Mission Breakout who let some members of Love Pop Ups London community come down to play both these historical unique escape rooms. Read all blogs and reviews from the comments section below for both rooms. All I can start off by saying about this place was wow from the moment you walk through the door you step back into history from the disused underground station at South Kentish Town Tube Station for this Escape Room located there. The evening kicked off by being given an army uniform (Jacket only) to dress the part then you are briefed on screen via Winston Churchill lookalike who explains what has happened within Bletchley Park operations, I won’t go into to much detail about the escape room challenges to prevent spoiling it for you but the challenges are all based around the Enigma machine along with various other challenges to get your brain thinking, we managed to escape with 5 minutes left on the clock so will you survive and set London free? 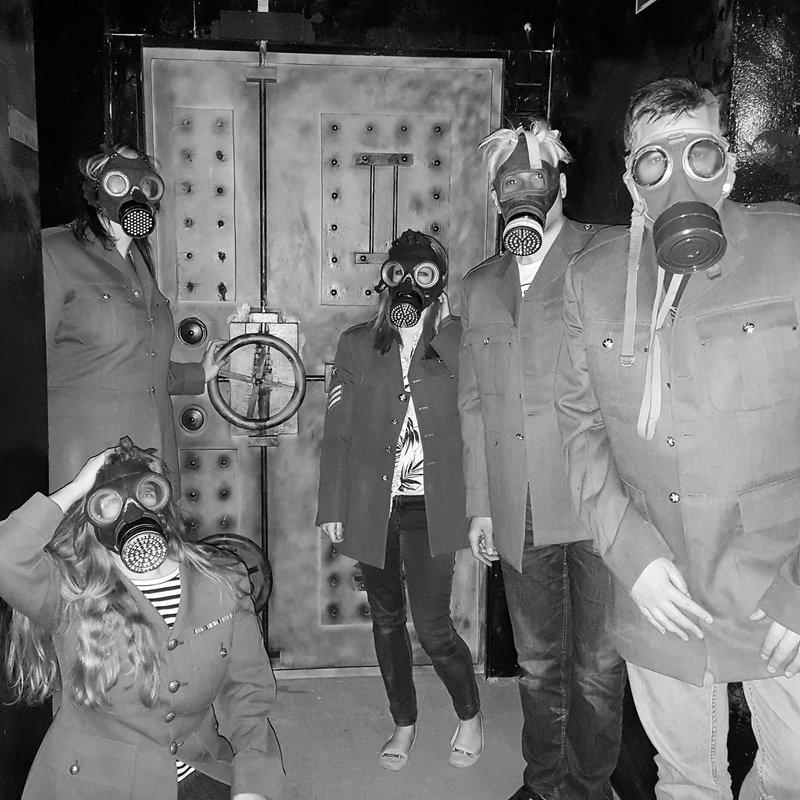 A great immersive escape room that i’m sure will have you talking about it for ages, this has to be one of my favourite escape rooms that i’ve done recently, plus you can have photos with a man made air raid shelter and gas masks after to really appreciate all the war efforts from that era. To read more open up my blog page. How does this place not rate more highly in London escape games? It is definitely the best I’ve been to – now there is a sentence to get you interested! It has been set up in South Kentish Town tube station; a disused station, also used as an air raid shelter in WW2, around which the whole escape game is themed. On arrival we had to enter our first code of the evening to get through the door. Down the stairs decked with signs such as “air raid shelter” and old photos along with atmospheric smoke we were greeted by friendly staff in army get-up and taken in for our debrief. Here we were handed military jackets and given an overview of the situation by Churchill himself! Then it was off in to the bunker (full of impressive props and great decor) where we were locked in with an hour to encrypted codes, work out who the traitor is and get the hell out of there. We completed it in 55 mins (phew) and found the clues varied (from the enigma machine, memory games to morse code). The tasks were set in chronological order, which I liked as you move from one to the other in a logical order and enabled everyone to work as a team – it was perfect for 5 people. At the end you are given a debrief with lovely, enthusiastic staff, who also answer any puzzles that still left you puzzled! Loved all 55 minutes of it! If you like WW1 and all things regarding Bletchley Park then this is an escape room for you! It’s themed very well with a lot of original props, it is best with a group of 5 or more as there is a bit to get through in the 60 minutes. The location is also perfect, it’s set in the disused tube station south Kentish town, about an 8 minute walk from Camden town or Camden road. This i would say is very professionally done, and the way the game has been designed is in quite a linear way, there is a lot of logic to the steps, that lead you onto the next clue. I know this can get quite expensive during a peak game time but I would say it will have you wishing you could do it all over again once you escape or your 60 minutes is up. You also get some great bunker WW1 style underground pictures you can take away with you as a keepsake (a great Facebook profile picture or Instagram post). Mission Break out is the only escape room in a disused tube station in North West London and it uses it’s location to give you a truly memorising experience. It was surreal to walk down stairs that had the old air raid shelter signs up and it gets you into the feel of the WWII theme of the escape room. Looking to try out the escape room evolution?? Then this might be the one for you.. Come and experience, feel, and listen to the sounds around you.. Solve the puzzles and get out on the other side!! What a fantastical and truly immersive 5 star experience. Amazing escape rooms set in the abandoned tube station of Kentish Town South. Had the chance to try the newest room: the lost passenger thanks to @lovepopupslondon. Overall a very cool escape room but only do it with a group of 4 max! Well done once again Mission Breakout!!! You’ll be brought down to a real abandoned tube station in Camden, and asked to sign off on some wavers. The story is that someone went down in the station and never came out, now it’s your chance to find out what happened. The lost passenger – will you be next?